This post is long overdue, as I finished What Video Games have to Teach us About Learning & Literacy by James Paul Gee more than a month ago, along with the other members of Book Club 106. It was a monumental achievement for me personally as I hadn’t ever read an “academic” text outside of required reading for courses. In fact, I haven’t read many books at all outside of required course readings for several years now. Thankfully, there were enough people out there on the Internet to encourage me to get through the heavier early chapters of this book, and finish with a wonderful, if exhaustively long, conclusion about several learning principles that can be derived from good video game design. Before diving into the final wrap up of this work, I wanted to share the two final Google+ Hangout discussions I had with a few more members of Book Club 106. I had to skip a couple of weeks of the video discussions due to a power outage after a wind storm knocked down some lines and some scheduling conflicts, but the next to last discussion with Jim Groom and Patrick Brewer was a satisfying conversation about providing balance in educational spaces between letting learners struggle and when to “step in” to help, and how to create a cohesive narrative in learning and curriculum design akin to game development. Oh, and we talked about some great video games! The final video discussion for the book was a treat for me because Rachelle Winkoop was finally able to join in for a video discussion after several technology induced mishaps that prevented her from joining in any of the previous discussions. We had the opportunity to talk about teachers needing to “step back” from being the sage on the stage, Montessori education’s place in the 21st century, and come back around to how James Paul Gee recognizes a lot of learning principles inherent in good video game design that can help prepare learners for being life-long learners, not necessarily life-long gamers. My final thoughts about this text hover around the great question posed by Rachelle in the last video discussion; we learn with much better context as networked learners, not just individuals, so how do we get students to a place where success is defined by being able to ask the right questions, and not just knowing an answer? Being able to simply provide the correct answer on a test or other final assessment piece is not always indicative of success in the real world, outside the confines of our school buildings. In the closing pages of chapter 7, Gee makes point to acknowledge the work of psychologist Lev Vygotsky (a reference I was hoping Gee would make), and his idea of individual’s possessing a “zone of proximal development”. This concept is typically essential reading in many teacher prepatory programs (or should be) as it describes that ever-shifting area between the level of accomplishment that an individual can achieve on their own versus the usually much higher level of accomplishment an individual can achieve when working with others. Other important points of the final chapters in this text speak to the growing “connectedness” that many successful emterprises, networks, and schools are beginning to adopt. The rationale that Gee makes for remaining critical and vigilant of patterns of practice that may seem to be successful at first blush, yet fall apart under deeper scrutiny, is a great breath of fresh air in the middle of the digital badges and gamification trends currently happening in many education circles. That’s not to say that I or Gee would necessarily disagree with either of the movements, but that in all areas of education, it’s important to remain reflective, and possess a modicum of self-cognition so as to keep the main goals of a project in constant focus. For example, on page 188 of the book, Gee maintains that although many schools and educational environments may experiment and alter their instructional design to better suit learners, adopting some of the learning principles he’s identified as being more effective than traditional methods, those institutions still cling to traditional assessments and measures of student achievement. This creates a dissonance between how we’re preparing learners to enter the real world, and how they will actually be challenged after their schooling is formally complete. Anyone expecting this text to be a ground-breaking departure from the current learner-focused, problem-based learning movement that’s taking root in many schools in the United States would be disappointed. That’s not to say this isn’t a great read, as I see it as the seminal work behind a lot of game design and gaming as metaphors for effective instructional design and learning. However, either due to the age of the text (it was originally written in 2004), or perhaps the rapidly changing climate of K-12 learning in our hunt for the next “magic bullet”, the collected thoughts of James Paul Gee seem rather matter of fact and straightforward. His 36 learning principles are rather concise, and make a lot of sense for any educator that has been wrestling with how to codify a method of successful instructional design. In other words, this is a great comfort read, for me especially on two levels, as I’m both an educator and a gamer. When Gee makes reference to Half-Life 2 I can recall many of the shared experiences he conveys while playing through it. When he makes the connection between the excellent game design that Valve put into Half-Life 2 and the learning environment, it’s done in an elegant manner that makes you realize why you didn’t see the connections before. Any educator that’s serious about their professional practice and gaming should read this book. It’s a little bit of nostalgia mixed with pedagogy, and an affirmation for those teachers looking to develop meaningful connections, collaboration, and reflection among their learners. Several sticky notes were sacrificed to decoding this worthy text. I can’t leave this collection of observations quite yet. While I warmed up to the text as I dug deeper into the chapters, and farther from Gee’s own self authored concept of semiotic domains, I realized a few connections between Gee’s observations and my own personal experiences. Of all the learning theories that Gee described, a few stood for me. These learning principles are the culminating observations of hundreds of hours of both video game play, and studying educational practice. While several describe or re-hash existing learning principles put forth by various psychologists and educational theorists, some bring the uncanny similarities between great game design and great educational design into clear focus. I jotted a few musings down in the margins and on stickies while reading most of the book (alright, so I heavily butchered the margins and went through nearly an entire pad of sticky notes), but I felt there were a few worth sharing. Of all the various types of games I enjoy, the Metroid series is probably the best example of this principle. Important tools and resources needed to gain access to higher levels of difficulty or different parts of the game world are earned and discovered as you play through the game. Often areas of extreme importance or interest can be seen just out of reach, making them tantalizing goals with no means of accessing them. Cleverly, the next large boss fight you encounter, or perhaps a newly discovered treasure will allow you the skills or tools to go back and access that previously unexplored area of the game. Just as in the game, in the classroom learners have access to a host of information, yet often we wait to give them certain tools and resources until we know that they will be able to accomplish learning goals with a higher degree of success. You aren’t given the ability to fire missiles, launch into devastating spin attacks, or double jump early in most Metroid games as the designers want you to explore the tools you do have access to, preserve ammunition, and try to solve problems creatively. As educators, we should be seeking ways to ensure that we aren’t “over-powering” our learners at too early a stage, giving them tools that might hinder them if they haven’t had time to fully understand, appreciate, and master underlying concepts. This is probably the most excruciatingly difficult principle for me to put in place. Our ultimate goal as educators is to push learners forward; push them to new understandings, new concepts, and to help them realize that what they can achieve is often limited by their experience, thus seeking out the experiences and wisdom of others can and should be a positive way to grow even farther. However, if we don’t critically examine our own experiences and reflect on them in a constructive way, the introduction of new materials, resources, and concepts can have the adverse effect of destroying the learner’s sense of self-confidence, and possibly even push them farther down a path of self-imposed ignorance. I struggle with this all the time. How do we cheer the ascension of the learner to a new learning goal, yet know that the very next week we’ll be introducing them to concepts and problems that may fly in the face of what they know, potentially reducing what they have learned to nothing more than an exercise in futility. It’s the same concept that applies to a group of individuals playing through a game together, such as an MMO, in which the skills, experience, and resulting accomplishments needed to pass low levels in the game become increasingly irrelevant as you progress to higher levels of difficulty. In other words, rushing head first into a band of Orcs with a battle axe may work when you’re still at a low level, dealing with just a few enemies at a time. However, once the game presents you with magic and long-range weapon wielding enemies, the “berserker” tactic may fail miserably, and you may even have to suffer humiliations in front of your peers as you struggle to adapt and win. I wonder how often I, and other teachers, may be ignoring this crucial principle of supporting learners as they struggle to move from an easier concept to a more difficult one in which earlier experiences no longer apply. One example that comes to mind is trying to apply the previous concept of multiplication as repeated addition to the multiplication of fractions. I haven’t yet figured out a fool-proof method, but I’m a huge fan of reflective journaling (hence my blog), and getting students to narrate how they went about tackling a problem in hopes that the meta-cognition going on will become the focus on the learning experience, not just the achievement at the end. That’s my takeaway from this text. A simple concept that while I may be merely a node in any network, and while any one individual may find it easy to assess my abilities and value through my ramblings on this blog or my singular efforts in the classroom, they would be underestimating my abilities to accomplish great feats as part of a larger network of learners and educators. As proof of this I would offer up the reality that while most of the videos I create and publish to YouTube garner not more than a few dozen views, it was only after an exhausting two full days of collaborative video editing work with a wide range of teachers, artists, and bloggers that I was able to produce a Back to the Future “Black and White” remix that wound up being featured on several other social media sites, including Gizmodo, and climbed above 100,000 views. My network made that happen, not me. So I should invest in this book on my kindle? or is it more of a hard-copy kind of book? I am now intrigued and simultaneously wish I had more reading time (maybe I’ll carve some out since I have yet to make a new year’s resolution!) and want to go sign up for your next book group session (again with the lack of time). I highly recommend having a hard copy of this book. 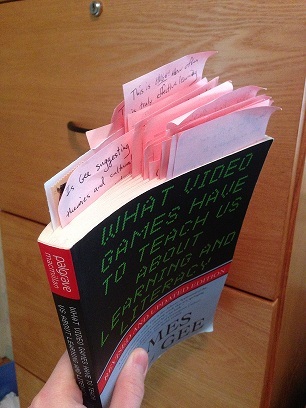 As you can see by the number of sticky notes I covered my poor copy with, Gee asks a lot of great questions that you’ll want to circle back on, make reference of in future readings, and reminisce about great games. As for having more time, don’t worry about that so much. It will come back eventually. I remember the period you guys were at, when my youngest wasn’t yet one, my wife was working a new summer job, and I was doing my Master’s work. There were several months were I slept, read, ate, wrote thesis, rocked the child, went to work, and had an occasional bathroom break…not sure if it was in that particular order. Hello Ben, I have read your whole article. Such great research work man! I must appreciate your effort. Thanks for sharing such kind of quality article. The videos you have shared here – make this article more interesting and user friendly. Keep it up buddy. Love to see more from you.